The paper presents results from a campus-wide survey at the University of Lille (France) on research data management in social sciences and humanities. The survey received 270 responses, equivalent to 15% of the whole sample of scientists, scholars, PhD students, administrative and technical staff (research management, technical support services); all disciplines were represented. The responses show a wide variety of practice and usage. The results are discussed regarding job status and disciplines and compared to other surveys. Four groups can be distinguished, i.e. pioneers (20-25%), motivated (25-30%), unaware (30%) and reluctant (5-10%). Finally, the next steps to improve the research data management on the campus are presented. Der Artikel stellt die Ergebnisse einer campusweiten Umfrage an der Universität Lille (Frankreich) über den Umgang mit Forschungsdaten in den Sozial- und Geisteswissenschaften vor. Die Umfrage hatte einen Rücklauf von 270 Antworten, was 15% der gesamten Stichprobe von Wissenschaftlern, Lehrkräften, Doktoranden, administrativen und technischen Personal (Forschungsmanagement, technische Dienste) entspricht; alle Disziplinen sind vertreten. Die Antworten zeigen eine große Vielfalt an Praxis und Nutzung. Die Ergebnisse werden in Bezug auf Berufsstatus und Disziplinen diskutiert und mit anderen Erhebungen verglichen. Vier Gruppen können unterschieden werden: Vorläufer (20-25%), Motivierte (25-30%), Unwissende (30%) und Zurückhaltende (5-10%). Schließlich werden die nächsten Schritte vorgestellt, um das Forschungsdatenmanagement auf dem Campus zu verbessern. Open Science is the transformation, opening up and democratisation of science, research and innovation, with the objective of making science more efficient, transparent and interdisciplinary, of changing the interaction between science and society, and of enabling broader societal impact and innovation (Ramjoué 2015, p.169). Open research data is one of the key components of the emerging new ecosystem of standards and services, and the EC priorities include raising awareness regarding data management, interoperability of infrastructure and datasets, and re-usability of data (ibid.). In France, the Conference of University Presidents put the issue of research data preservation and sharing at the top of their priorities during their annual conference in 2015, the Ministry of Higher Education and Research supports and promotes related actions, and all major public research organizations such as the CNRS (Centre national de la recherche scientifique) contribute to the development of data infrastructures and repositories. one size does not fit all. Also, organizational or national policies and projects (top-down) require support and back-up from the scientific communities and local structures (bottom-up) to meet the scientists’ needs with success. To support the step-by-step development of sound research data management practices, you must first understand researchers’ needs and perspectives (Ward et al. 2011, p.265). At Lille, we started in 2013 to work in the field of research data management, in particular on the social sciences and humanities campus (Lille 3) with 19,000 students, 580 PhD students, 850 academic and 600 technical staff, in order to gather empirical evidence for the development of data literacy programs and new library-based data services and to raise awareness among scholars and PhD students. This research is conducted together with the GERiiCO laboratory (information, communication and cultural studies), the graduate school and the academic library, with the support of the University’s research department. The following study is work in progress. We present the results of a campus-wide survey on data practices and needs in 2015 and compare them with other studies, including those from Humboldt-Universität zu Berlin (Simukovic et al. 2013, 2014). The complete results have already been published on our institutional repository HAL-Lille 3 (Prost & Schöpfel 2015). The further reading section contains other papers on our research work. The campus-wide survey was conducted in April and May 2015 (five weeks). The questionnaire contained 22 questions adapted from the survey from Humboldt-Universität zu Berlin mentioned above, comprising six sections: information about the respondent, data typology (sources and results), preservation and backup behaviour, sharing behaviour, opinion and motivation regarding data sharing and data repositories, data-related needs. The questionnaire (in French) was communicated to the whole research community on the social sciences and humanities campus (1,800 persons) in the form of an anonymous online version on a local LimeSurvey server. The data analysis and interpretation was done between June and August 2015, and the data were compared to other results from Berlin (Simukovic et al. 2013, 2014), Strasbourg (Rege 2015, Rebouillat 2015), Iowa (Averkamp et al. 2014), LIBER (Reilly et al. 2011), the European Commission (Kuipers & van der Hoeven 2009, see also Herb 2015) and Austria (Bauer et al. 2015). The survey received 270 responses, equivalent to 15% of the whole sample of scientists, scholars, PhD students, administrative and technical staff (research management, technical support services). All scientific departments and research laboratories are represented. Larger and representative sub-samples are from psychology, history, education, information and communication sciences. Also, all professional groups took part in the survey. 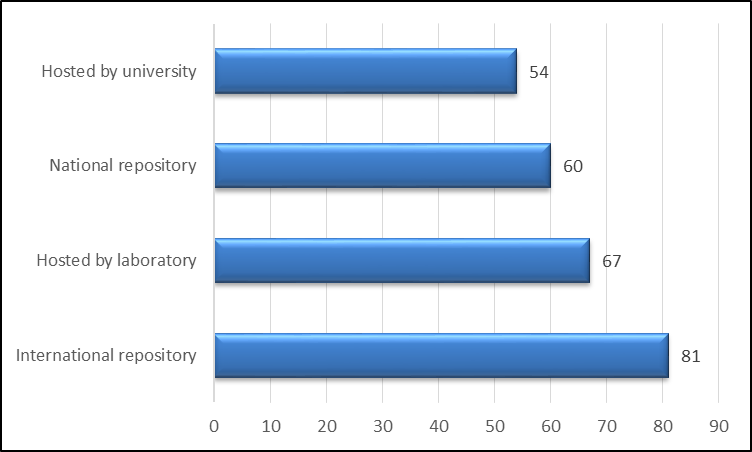 The largest group of sub-samples are PhD students (n=73) and senior lecturers (n=69), followed by professors (n=40), scientists (n=16) and other staff (n=13). 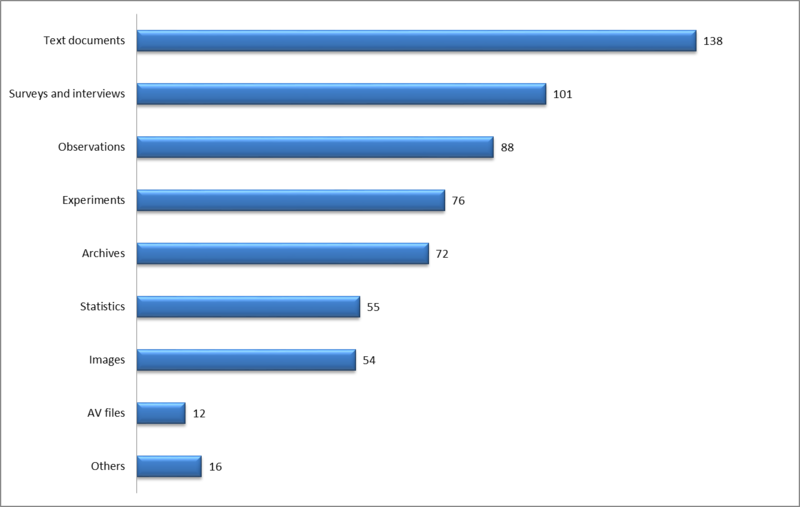 But the most representative group are professors (26%), followed by senior lecturers (17%) and PhD students (13%). All respondents were asked to answer to the whole list of 22 questions but no question was obligatory. Multiple answers were allowed for most questions. As a result, no question received 100% answers, and the response rate per question varies between 12% and 82%. One part of the questions was about research data behaviour – which kind of data are used and produced, how they are stored, preserved, safeguarded; and how they are shared with other researchers. The responses show a wide variety of practice and usage. 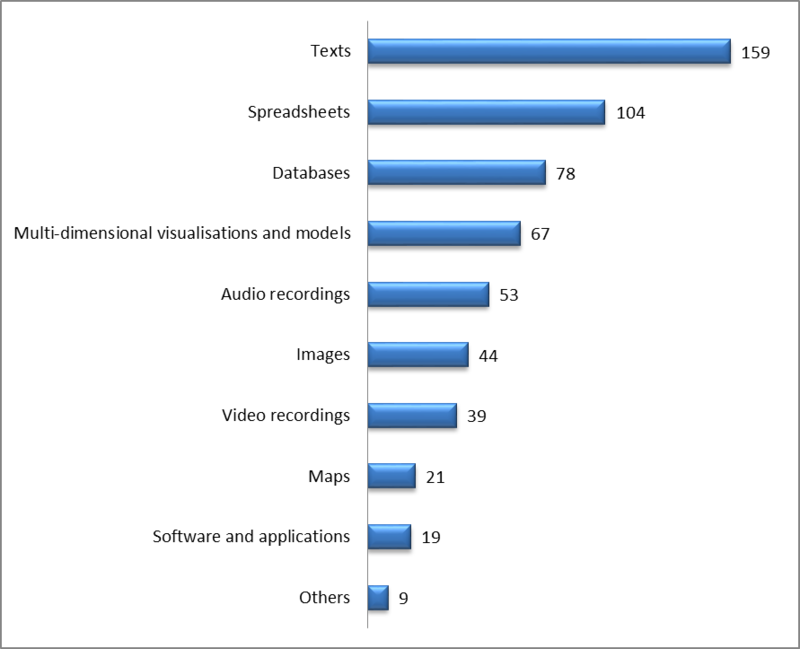 The survey identified text documents as the most important data source, followed by observations, interviews and survey data (figure 1). Other, less important data sources are experiments, archival material, statistics, images, and audio and video recordings, while log files or simulations are missing, at least in our sample. Figure 2 shows the research data produced by the respondents. Again, text documents are the most important output type, followed by spreadsheets, databases, multi-dimensional visualisations and models. Other data types like audio and video recordings, images, maps or software are less important. 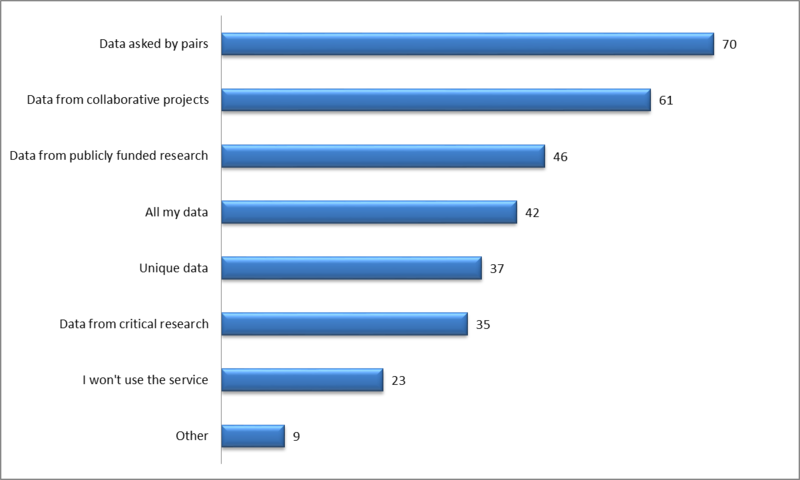 Most of the respondents prefer local solutions for the storage of their research data, either the hard disk of their private personal computer (83%), or their professional work-station (49%) (figure 3). Only 12% store their data on a campus-based server. 19% conserve their data in the cloud, on a distant server (gratis or not), and 8% store them on another institution’s server, probably in collaborative, multi-site research projects. 55% say that they store their data in two or more different places, which means usually on the personal (private) computer and on the work-station on the campus. 76% say that they also make use of other devices, most often external hard drives (61%) and USB flash drives (46%) while other devices such as CD or DVD are mentioned by few. How much memory space do they occupy? 38% of the respondents do not know exactly. 51% estimate their storage size at up to 100 gigabytes while only 13 respondents (half of them are psychologists) mentioned 1 terabytes or more. While 28% state that they back up the data on a daily schedule, nearly as many (26%) do it on an irregular basis, each time when needed or from time to time . Nearly all of them (97%) say that they are the only people in charge of the preservation of their research data and that there is no data officer or at least another person specifically designated to perform this task. Taken together and as a whole, these responses appear to reflect a more or less individual data behaviour, private rather than professional, with available, often private (and cheap) devices but caring for security and backup. We cannot say if the respondents already faced serious problems with their research data (loss of data, security breach etc. ); probably they never have because they do not seem really unsatisfied with this situation. 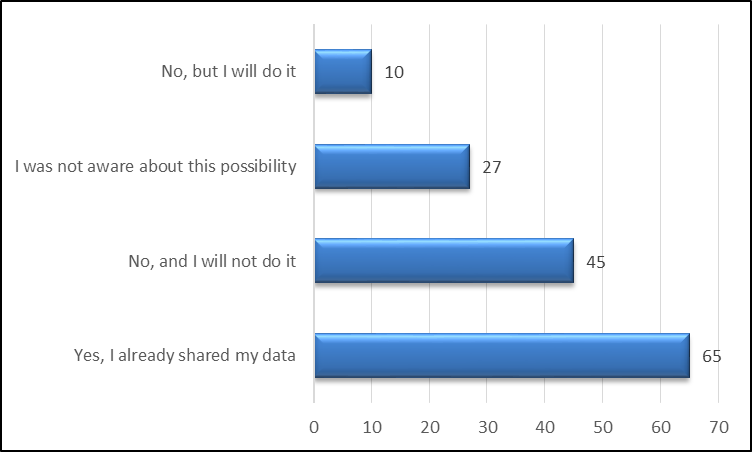 Most respondents (64%) do not share their research data with colleagues or other people (figure 4). Nobody, except themselves, have access to their data files. The survey does not really identify one or two priorities. The answers rather reflect a set of needs, some more important (storage space, general advice for data management), others a little bit less (technical and legal issues, publishing and citing). One third mentioned ethical issues and help for the preparation of data management plans (DMP). We also tried to measure the colleagues’ general willingness to deposit and share their data. Are they motivated? Which kind of data would they deposit? Would they publish their data along with articles? Which data repository would they prefer? About 40% of the respondents express a positive opinion about data sharing. Either they have already deposited their data in a repository (16%) or they intend to do so in the future (25%). 30% admit that they were not aware of this possibility (figure 6). Another third (29%) clearly say that they never deposited their research data in the past and that they have no intention of doing so in the future. A deposit in a data repository is no option for five reasons: sensitive and confidential data, risk of plagiarism, workload, data illegibility ( nobody would understand my raw data ) and intellectual property ( these are MY data ). This rejection of data sharing significantly decreases when it comes to the question of publishing data along with an article, i.e. when data sharing is incentive or obligatory (figure 7). 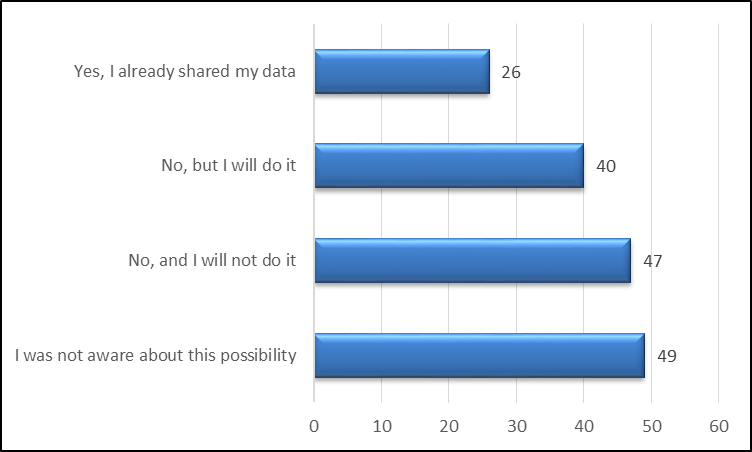 Here, only 7% declare that they never shared their data in the past and that they will not share them in the future. 44% of the respondents state that they have already published data together with an article, and 31% announce that they intend to do so in the future while 18% admit that they simply did not know about this possibility. We also asked when and which kind of data they would share. Again, only 12% clearly state that they will not deposit or share their research results in this way (figure 8). 37% underline that they would share those data asked for by their peers while others say that they would deposit data produced in collaborative research projects (33%) or with public funding (25%). The last question was about the kind of repository they would prefer for the deposit and sharing of their research data (figure 9). Even without a clear preference (many respondents mark more than one answer), we can identify a ranking of preferred options. The academic library plays a central part in particular in education, advice and assistance. The library will also be partner to a series of in-depth interviews with a smaller sample of scientists (n=30-50) in order to learn more about data behaviour, best practices and data-related needs. And the academic librarians’ contribution is expected and necessary also for the development of infrastructures and tools. The study was supported by the Department of International Relations of the University of Lille 3 and the European Institute for Social Sciences and Humanities at Lille. We would like to thank all colleagues who contributed to the success of the survey, in particular Peter Schirmbacher, Maxi Kindling and Elena Simukovic (Berlin), Isabelle Westeel, Cécile Malleret and Stéphane Chaudiron (Lille). Herb, U., 2015. Open Science in der Soziologie. Eine interdisziplinäre Bestandsaufnahme zur offenen Wissenschaft und eine Untersuchung ihrer Verbreitung in der Soziologie. vwh Verlag Werner Hülsbusch, Glückstadt. Rege, A., 2015. Retour sur l’enquête sur les pratiques de publication scientifique et de production de données de la recherche. In: Université de Strasbourg, Projet AOC, COPIL 27 mars 2015. Joachim Schöpfel is Lecturer of Library and Information Sciences at the University of Lille 3 (France), Director of the French Digitization Centre for PhD theses (ANRT) and member of the GERiiCO research laboratory. He was Manager of the INIST (CNRS) scientific library from 1999 to 2008. He teaches Library Marketing, Auditing, Intellectual Property and Information Science. His research interests are scientific information and communication, particularly open access, research data and grey literature. Hélène Prost is an information professional at the Institute of Scientific and Technical Information (CNRS) and associate member of the GERiiCO research laboratory (University of Lille 3). She is interested in empirical library and information sciences and statistical data analysis. She participates in research projects on the evaluation of collections, document delivery, usage analysis, grey fliterature and open access, and she is the author of several publications.